Curse of Cassandra’s new album Nekonomicon is the follow up to their underground hit Cult of Cats. Nekonomicon is darker, witchier and kittier than ever! The electronic duo from Cincinnati, Ohio mixes ghostly vocals, glittering dance beats and industrial saxophone, to conjure worlds of ‘witch dance’ and ‘grave wave.’ Traveling with their sphynx cats Armand and Asia on the 80+ show Cult of Cats tour, Curse of Cassandra opened for dark alternative music greats like My Life with the Thrill Kill Kult, September Mourning and Angelspit. The witch dance duo is on the road again with Nekonomicon, only with more spells and charms. meow. Voted Best Electronica 2015-2017 for Best of Dayton Underground, they have had successful radio play on more than 150 stations nationally, and licensing deals with 10 networks including E!, A&E, and MTV. 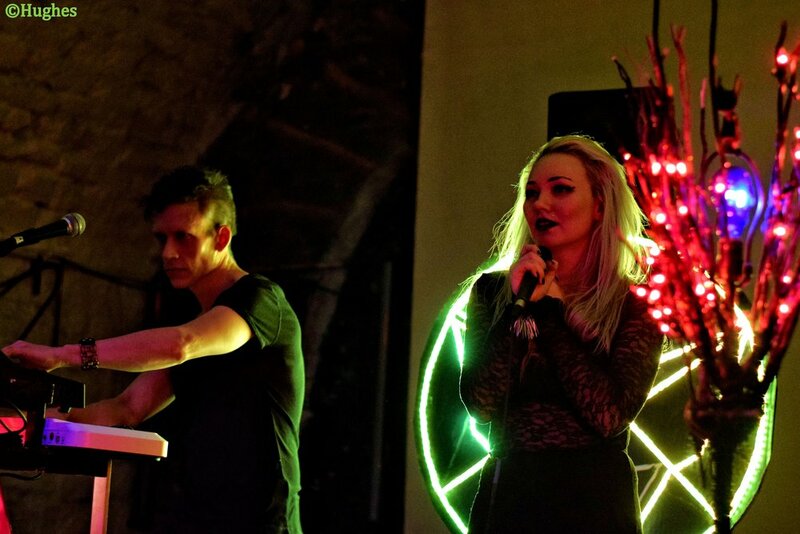 Curse of Cassandra incorporates live theatrical elements such as lighting, fog and audience interaction during their performance by gifting cat ears to fans from the stage and bringing them into the 'cult of cats.' Mixing EBM style beats with live acoustic drums, lead vocal changeups from song to song between two singers, and industrial saxophone, Curse of Cassandra brings a live band experience that bridges the gap between electronic DJ-based venues and traditional live performance venues crossing easily among different genres. Nicole sings through a vocal processor (Boss ve-20 Processor). She needs 1 XLR to board. She has her own mic and mic stand. Jacob needs 1 XLR to board and a boom stand with mic if available. The music needs 2 XLR to board with 2 sources of power. The venue will need to supply a PA system with speakers, subs, monitors & mixer. The venue will also need necessary cords, cables and power hook-ups for the PA system. If this is not possible, please contact the band to come up with alternative solutions. The band provides a fog machine and some ambient lighting as part of stage show. The band needs a 4 x 6 space that is visible to set up merchandise table.